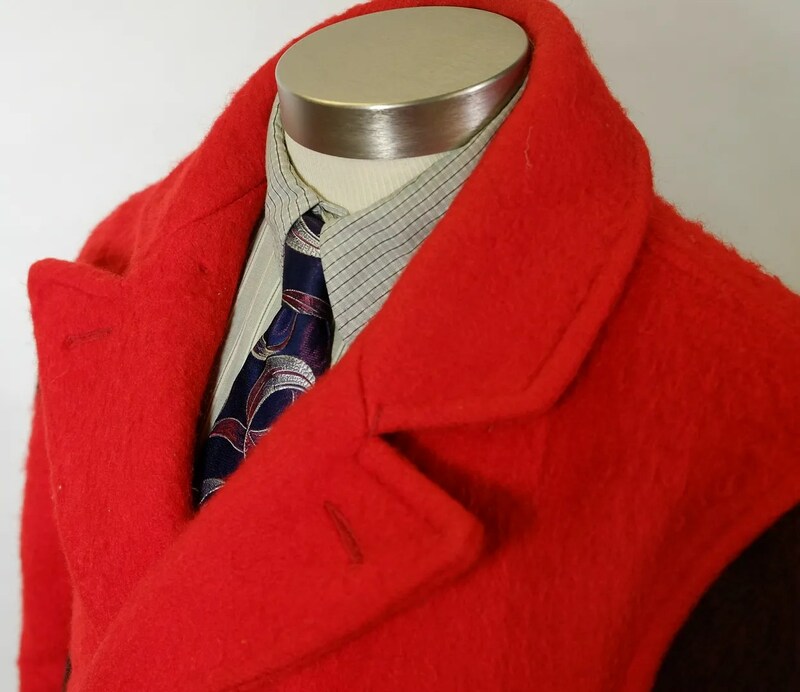 This vintage coat was made in the USA by Congress under the Maine Guide Sportswear label. 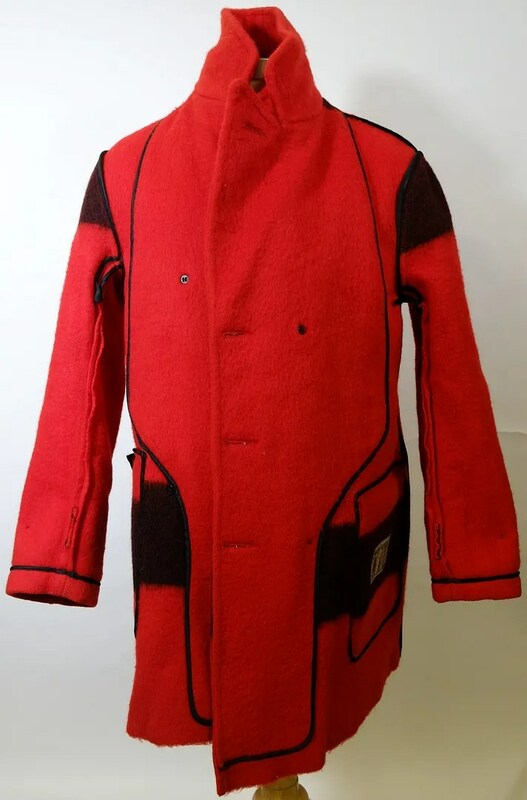 It is made from English-made Hudson’s Bay point blanket material, one of the highest quality and most expensive wools on the market for this type of coat at that point. 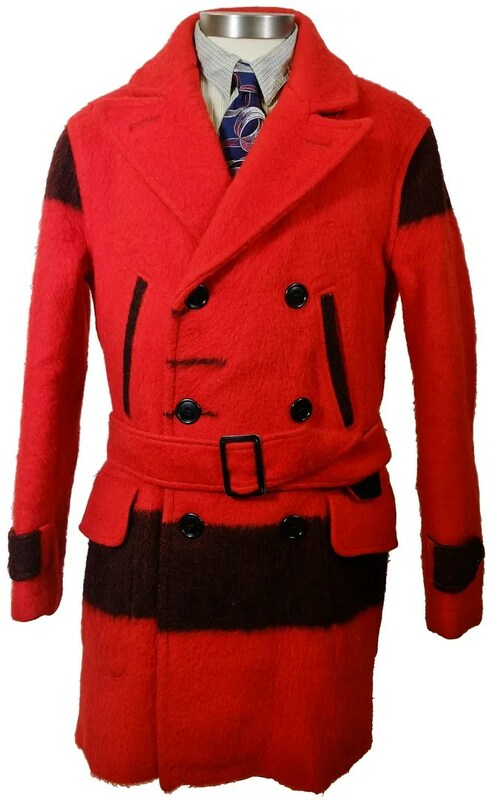 These coats were most popular in red and black stripe, and in multi-stripe (green red, yellow and indigo stripes on a white background). The style of the Hudson’s Bay label and the (R) symbol on the Maine Guide label help to date this to the late 1940s, although the overall pattern of the coat belongs more to the 1930s. 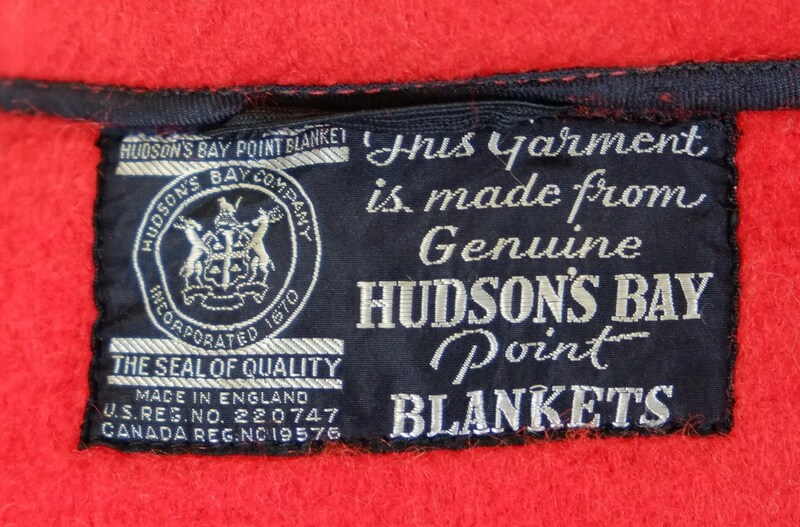 There were two major waves of Hudson’s Bay Point Blanket mackinaw popularity, one in the mid 1930s and one immediately after WWII. The ones from the 1940s period to which this one belongs were generally beltless and single breasted, whereas this fits the traditional mackinaw mold of the 1920s and 1930s, but with a bit more flair. 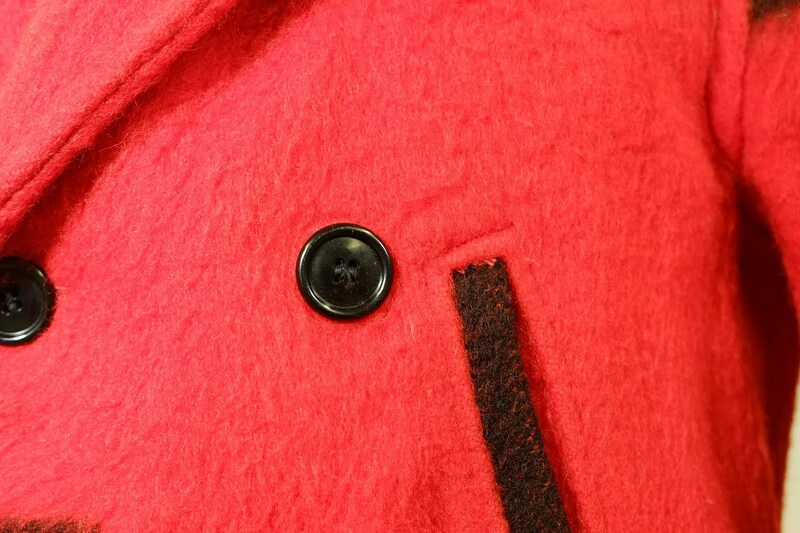 I like the way the Maine Guide coats use the pattern of the blanket to accentuate the details of their coats. The “points” of the blanket are right up front. 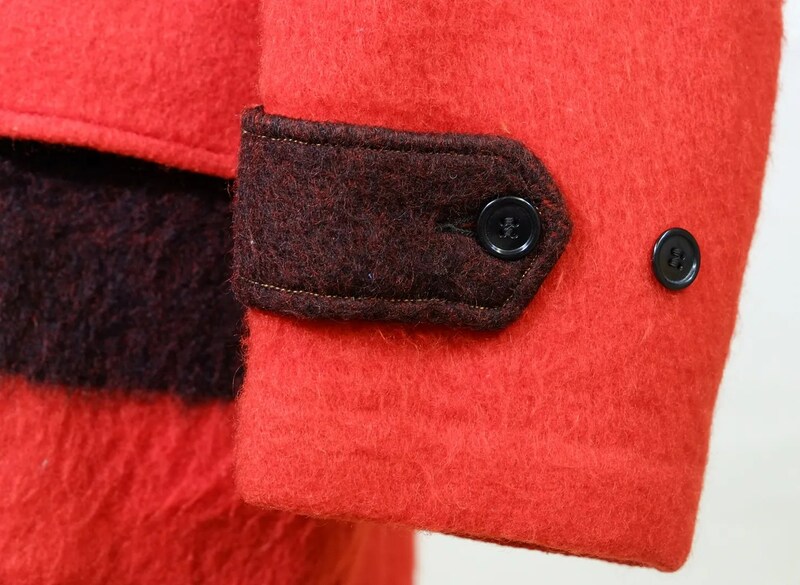 The sleeves are defined by the stripe, as are the handwarmer pockets and the buttoned sleeve adjuster belts. The hip pocket flaps contrast against the main stripe. Some manufacturers of point blanket coats merely tailored their standard mackinaw pattern in a different material. Maine Guide went the extra step to take full advantage of everything the iconic Canadian fabric had to offer. The blanket wool is thick and has a long nap, which is also more typical of earlier production blankets than those found on coats dating from the 1950s-present, after manufacturing was switched from England to Canada. It makes sense, as the company had a lot of experience with blanket coats. In the early 1930s, Maine Guide produced a model with a double breasted chest and a zippered bottom. A really unique look. 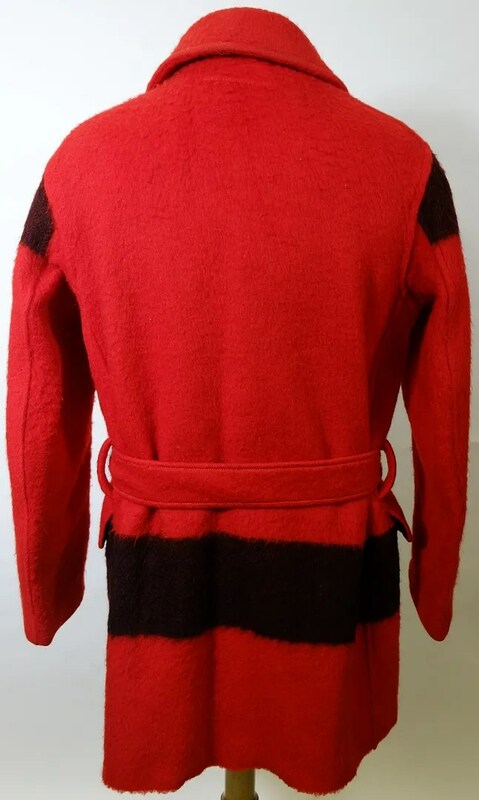 This coat is double breasted and belted, and has stylish peak lapels and a rounded collar which I have only seen on blanket coats made by Maine Guide. 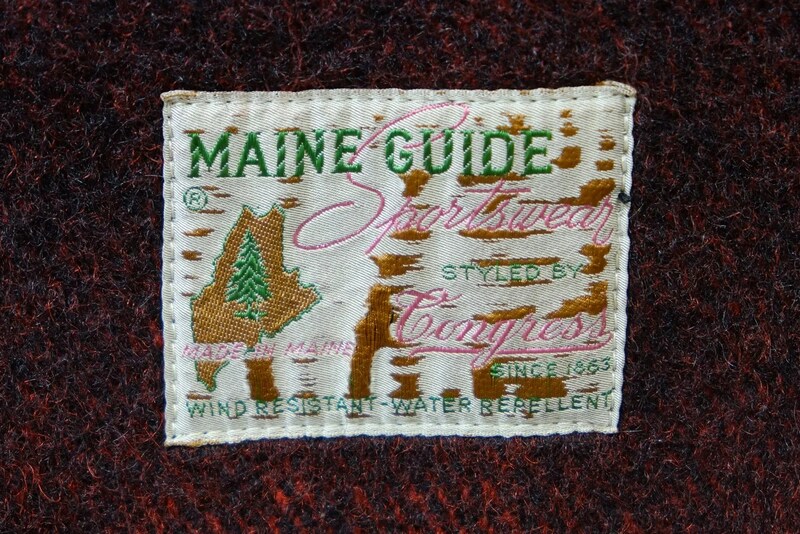 Another unique feature to Maine Guide is the bottom hem, which uses the edge of the blanket, instead of having a bottom seam. 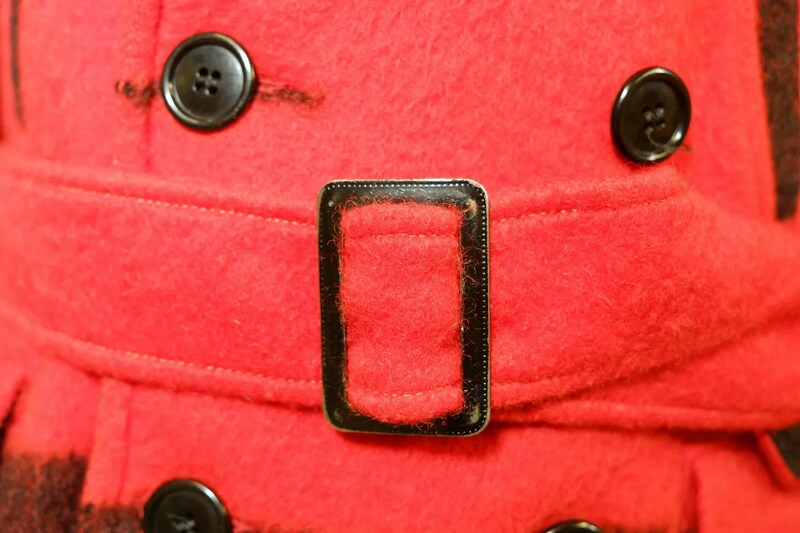 The coat is unlined, which is more typical of pre-war patterns. 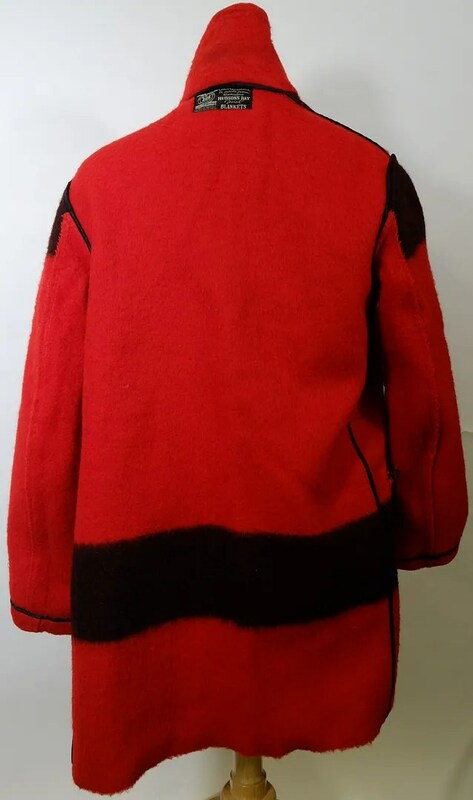 This entry was posted in Coats and tagged 1940s, blanket coat, clothing, coat, Congress Sportswear, double breasted, fashion, Hudson's Bay, Hudson's Bay Company, mackinaw, maine guide, mens, point blanket, red, style, vintage by Spencer Stewart. Bookmark the permalink.